Blogging is a new industry that I am venturing in.I love covering events and writing, the mere reason why I took Broadcast Communication, and honestly I enter the industry to ease the frustration that I have since I didn't end up doing the things that I love the most. 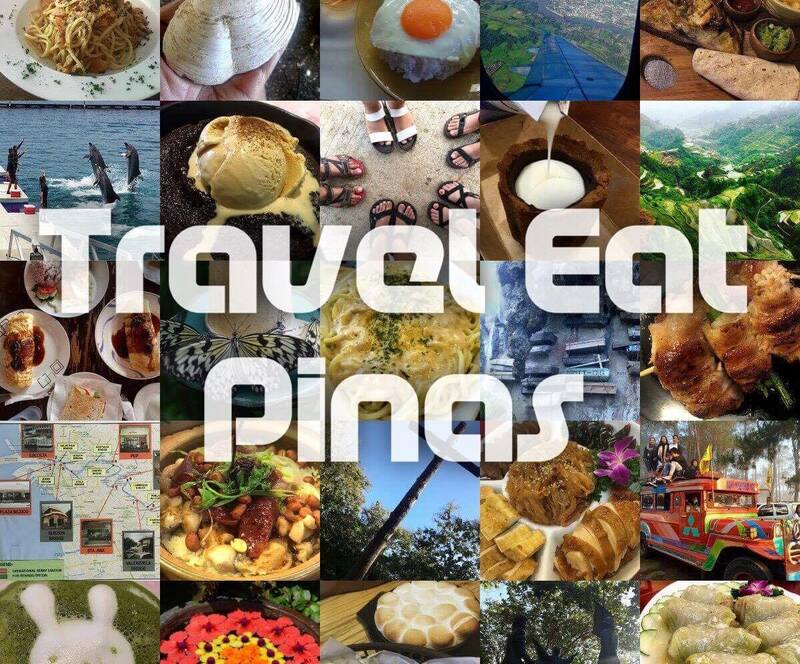 When I put up my blog Walk With Miss Piggy my purpose is to disseminate information so that readers would know where to visit, costing and what to expect when they travel on a certain place in the Philippines and to know what restaurants they can try or those that might dismay them. At first all I wanted is to write and become an effective tool in disseminating information but as I go along the exciting wave of blogging I realized that the former has a lot to offer. As I go deeper the industry, meet bloggers and attend events. I learned that blogging can provide me more things that I didn't know that I achieve with it. In almost three months of blogging my writing frustration is pacified, I get to learn a thing or two on every bloggers I meet, my horizon widens with every event I attended, I get freebies from different companies but most of all what I didn't know that blogging can give me is the opportunity to generate additional income. 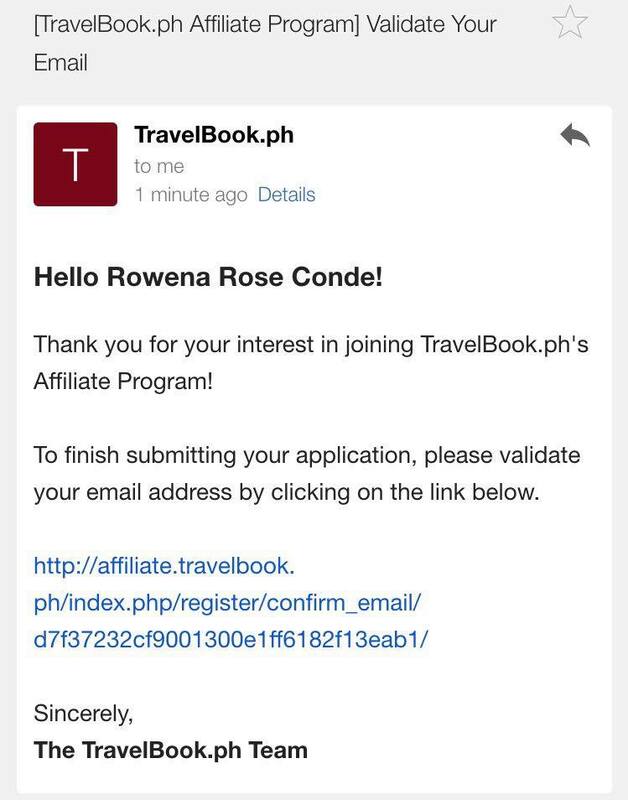 I learned about this opportunity when I stumbled upon TravelBook.ph Blogger Affiliate Program of TravelBook.ph . I though being an affiliate means you will be part of their group of travelers and that's it, but, when I visited their website, I realized that my expectation was wrong. Based on their website, Travel Book was established by Recruit Holdings as an online e-commerce travel company in the Philippines that was launched March 2013. As of June 2016 Travel Book has more than 520,000++ likes on their Facebook Page, the highest listing of Hotel Properties in the Philippines which is 2,700++ and their company is growing over 200% compared with their last year's performance. Travel book wants to provide valuable experience to the people who want to travel the Philippines by giving them an easy access in booking their hotel with 24/7 customer service that can assist them and paying their bookings via credit card, over the counter or through Bayad Centers. I also learned that TravelBook.ph wants to work hand in hand with bloggers, like you and me, in providing travelers a great and valuable experience through the TravelBook.ph Blogger Affiliate Program. 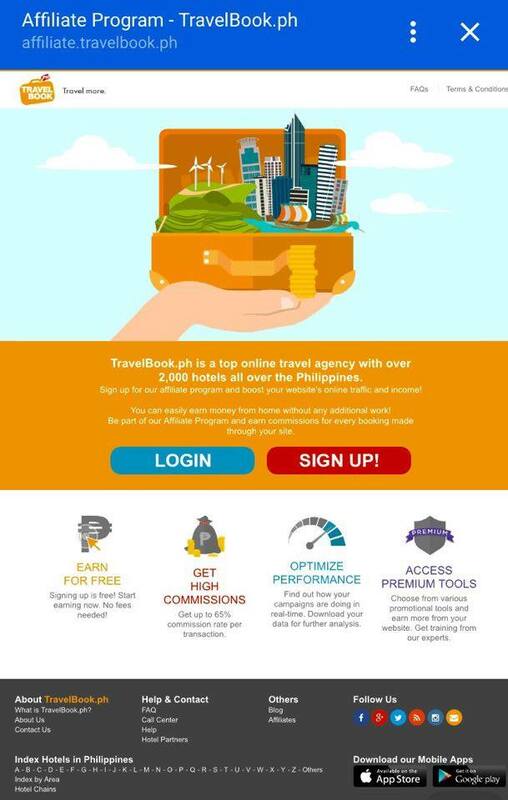 The program would benefit both the travelers, by giving them a hassle free hotel bookings by clicking the promotional tools of TravelBook.ph on our website, and us ,bloggers, by converting our traffic to hotel bookings and earn up to 65% commission rate per transaction. 1. 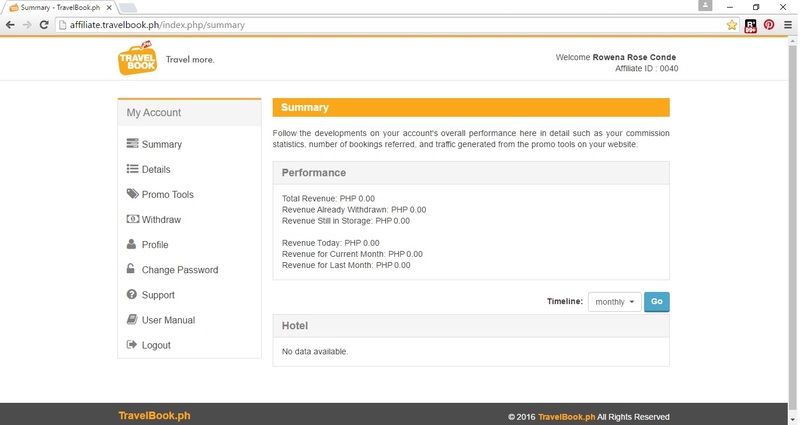 Go to affiliate.travelbook.ph and click SIGN UP to register. 2. Fill up the registration form. Details and once done click FINISH. Email address by clicking the link that was sent on your email. 4. 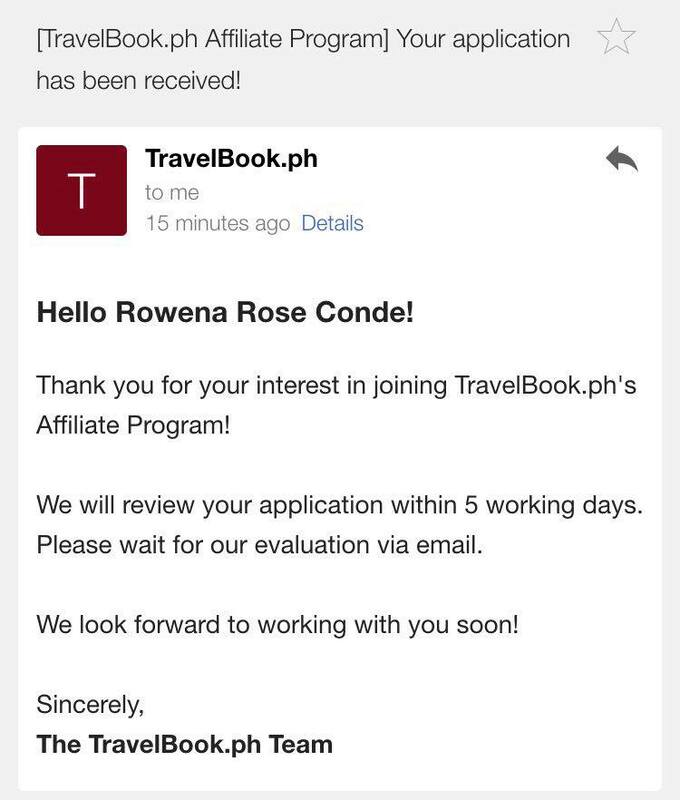 You will receive and email stating that TravelBook.ph will review your application in five working days. 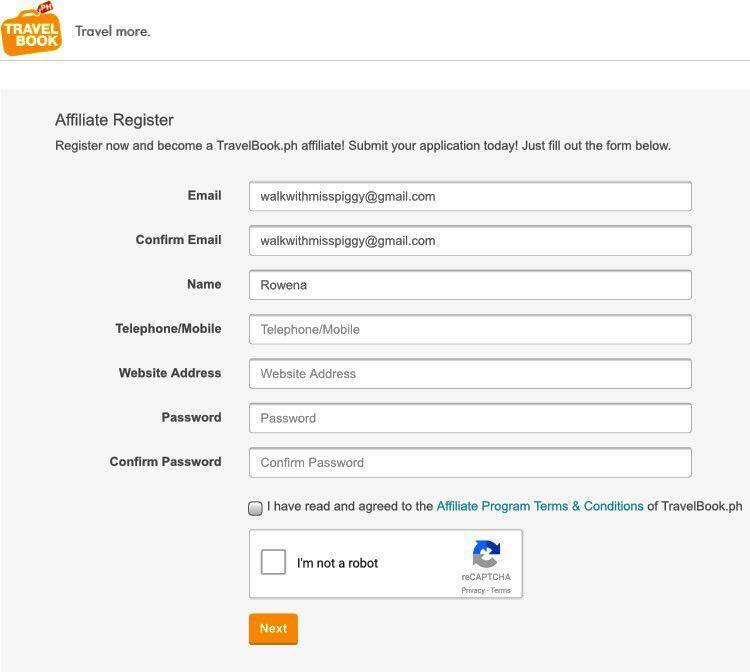 Once approved we can have our own user friendly account on the Affiliate Website, wherein we can get promotional tools like user friendly hotel banners and advertisement links that we can put on our website to promote TravelBook.ph, profile update tools, support, manual and the process to withdraw the commission. 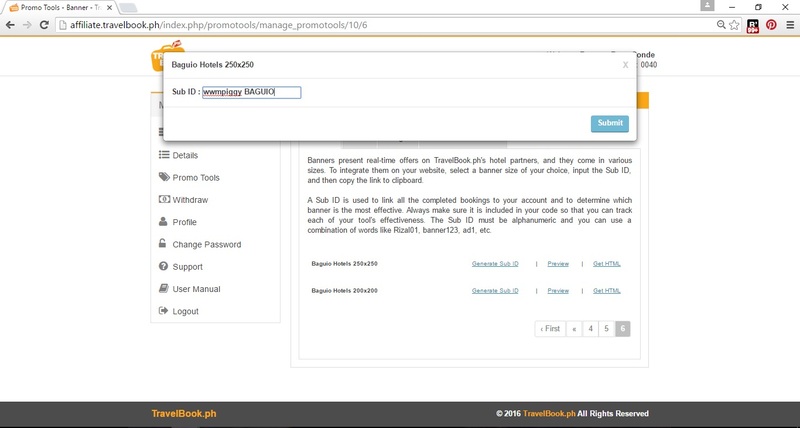 Upon receiving their confirmation, we can start to apply TravelBook.ph's promotional tool. 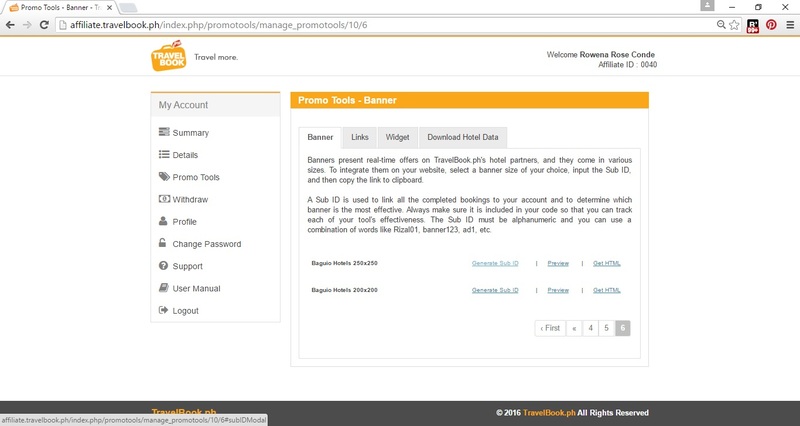 We have three options to use- banner, hotel ad link and search widget. 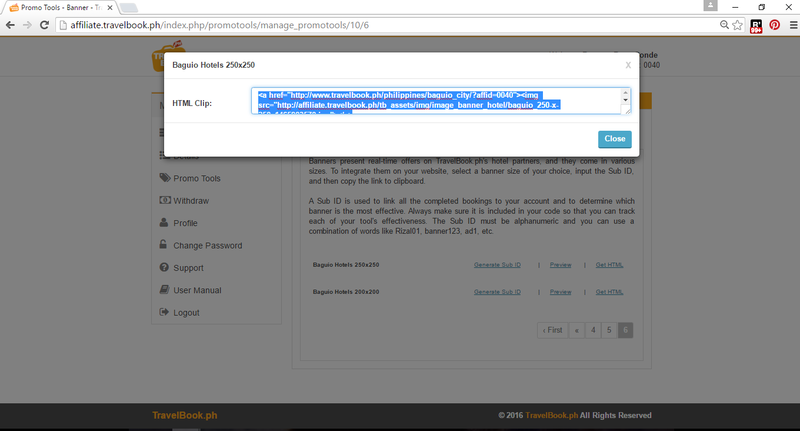 When I got TravelBook.ph confirmation, I apply the banner on my website. It is easy to put one, all you have to do is follow this simple steps that I did. 1. Click the Promotional Tool tab located at the left corner of the page. Then click Banner. Upon clicking it, list of locations of hotel will appear. Choose the size of banner and location of hotel that you want to put on your website. 2. Generate Sub ID and click submit. This is important because it will be used to monitor the bookings linked on your account and to identify which banner of yours is effective and not. 3. 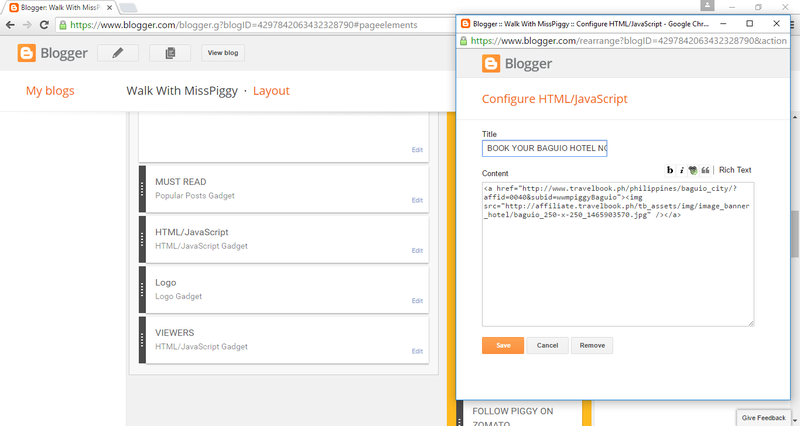 Generate the script by by clicking and copying the GET HTML. 4. Paste the HTML on your blog website. 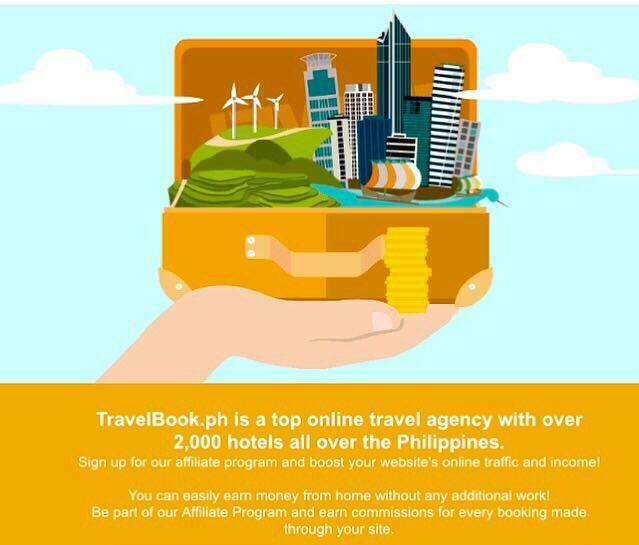 TravelBook.ph Blogger Affiliate Program is one of the perks that made me like blogging more. 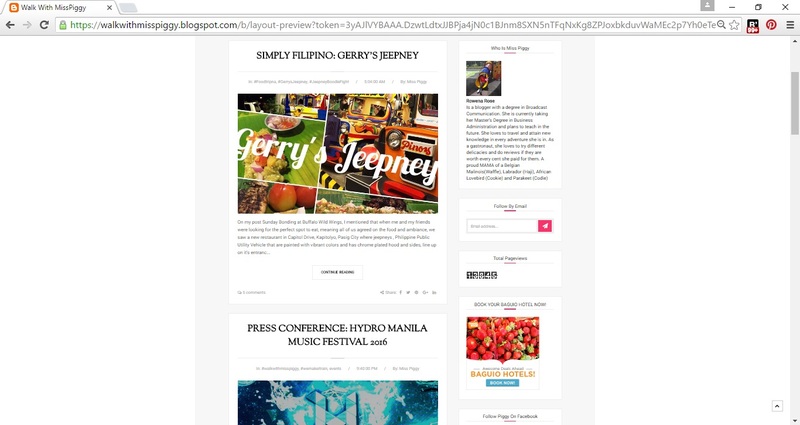 I can do my blog's vision, disseminate information to make others travel and food trip hassle free, what I love, writing and at the same time an opportunity to gain additional income of up to 65% commission rate per transaction which is a lot considering that you just need to put a hotel's link or banner on your blog website.